Hoo-rag is proud to announce a partnership with Lucky Tackle Box and Clenzoil. 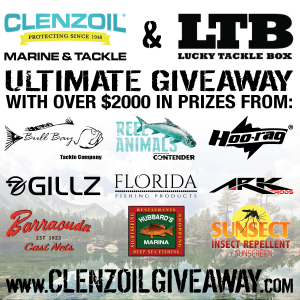 We’re excited to tell you that more than 30,000 boxes went out this month to Lucky Tackle Box members with information on how to win some exceptional prize packages being sponsored by Clenzoil, Hoo-rag and other great companies. Prizes include Solartek Max Hoo-rags, Barracuda Cast Nets, Ark Viper Casting Rods and more. *Hoo-rag has provided items to Clenzoil for fulfillment and is not responsible for choosing winners or providing prize packages. Previous post: ATTENTION PRO STAFFERS!